DOHA, Qatar, March 27, 2019 /PRNewswire/ -- Hamad International Airport has been ranked as the fourth best airport in the world at the SKYTRAX World Airport Awards 2019, which took place during the Passenger Terminal Expo 2019 in London, United Kingdom. HIA has also once again been ranked as a five-star Airport and was honoured with the title of 'Best Airport in the Middle East' for the fifth year in a row and 'Best Staff Service in the Middle East' for the fourth year in a row. The awards recognize HIA's innovative facilities, five-star customer service and state-of-the-art terminal which accommodates more than 30 million passengers annually. The 2019 World Airport Awards by Skytrax are based on nominations from millions of passengers across more than 500 participating airports worldwide, making them one of largest passenger interaction survey awards in the world. 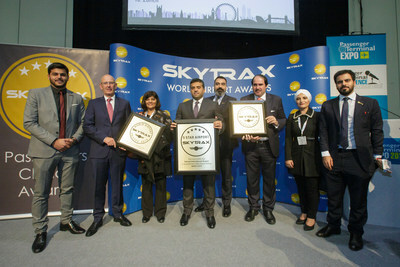 Commenting on the results of the Skytrax World Airport Awards, Engr. 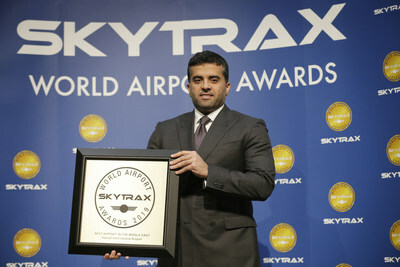 Badr Mohammed Al Meer, Chief Operating Officer at Hamad International Airport, stated: "We are delighted with our progress and ranking at this year's Skytrax Awards as we successfully moved up in our ranking to 'Fourth Best Airport in the World' while maintaining our five-star status and our titles as 'Best Airport in the Middle East' for the fifth consecutive year and 'Best Staff Service in the Middle East' for the fourth consecutive year. We are committed to raising the bar when it comes to the airport experience and will continue to invest in our facilities, services and technologies that distinguish us as the airport of choice for millions of passengers around the world." "Skytrax holds a very special place for all us at HIA, because it's a platform for our passengers and travellers to share their view on their experiences with us. We are truly honoured and humbled by the support and loyalty of our customers and are motivated more than ever to continue to deliver excellence and meet the needs of our passengers and community at large," Al Meer added. HIA, the gateway to Qatar and to the World. Positioned at the edge of the Arabian Gulf, Hamad International Airport's tranquil waterside setting provides a perfect backdrop for its stylish architectural elements, underpinned by advanced airport systems in line with its 'Smart Airport' vision. Operating 24/7, the airport features two runways, a state-of-the-art air traffic control tower and currently processes 30 million passengers per year and 360,000 aircraft per year. With over 40,000 square meters of combined retail, food and beverage facilities, unmatched spa facilities and a collection of unique art pieces from internationally acclaimed artists, HIA is a destination on its own, designed for the modern traveler.